As expected, T-Mobile(s tmus) had a blowout quarter, turning phone subscriber losses at Sprint and Verizon into its own gains. T-Mobile added 2.4 million total subscribers in Q1, including 1.3 million valuable postpaid subscribers, marking a new quarterly growth record for T-Mobile in a post-holiday period that’s usually sluggish. The most significant number was T-Mobile’s 1.2 million postpaid phone net additions, comprised mainly of core smartphone customers on voice and data plans. Those are the carriers’ most valuable customers, and in the first quarter T-Mobile demonstrated it could steal them away from its larger competitors. Verizon(s vz) shed more than 100,000 feature phone and basic smartphone customers in Q1, while Sprint(s s) saw 230,000 postpaid customers depart. AT&T(s t) actually had a great quarter, totaling 625,000 new postpaid customers, though it also showed evidence of its smartphone growth slowing. “T-Mobile captured virtually all of the industry phone growth while successfully taking share from our competitors,” CEO John Legere said during T-Mobile’s Q1 earnings call. Legere added that one competitor was particular fertile ground for T-Mobile’s growth: T-Mobile took 17 customers from that carrier for every one customer it took from T-Mobile. Legere wouldn’t name that carrier, but it’s almost certainly Sprint(s s). Here’s how the rest of the 2.4 million net additions broke down: 465,000 prepaid subscribers on both the T-Mobile and MetroPCS brands; 383,000 new wholesale connections on virtual operators; and 220,000 machine-to-machine (M2M) connections. If you wanted evidence that T-Mobile’s Uncarrier strategy is working, here it is. But it’s also taking a big financial toll. 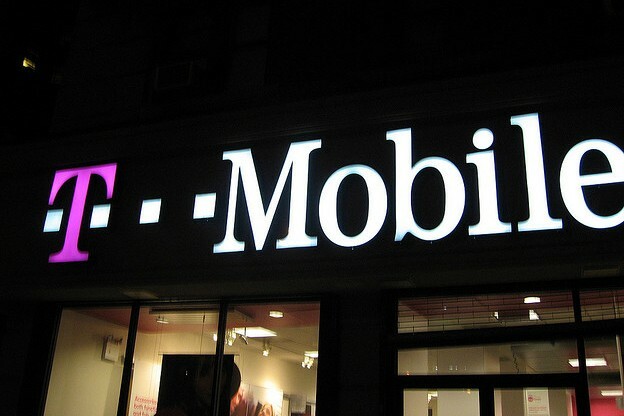 T-Mobile reported a first-quarter loss of $151 million. In Q1 of 2013 — the quarter before Uncarrier went into effect and the acquisition of MetroPCS closed — T-Mobile posted a $107 million gain. It hasn’t reported a quarterly net profit since. Uncarrier’s barrage of price discounting, new programs and promotions are eating away at T-Mobile’s operational margins (falling from 29 percent to 20 percent year over year). It seems to be a sacrifice that T-Mobile is willing to make in order to gain market share and become a bigger competitor in the industry. T-Mobile now has 49 million subscribers, compared to Sprint’s 55 million. If the company keeps having blockbuster quarters like this — and if Sprint continues to perform poorly — T-Mobile could overtake Sprint, becoming the No. 3 carrier in the country. That is, if Sprint doesn’t acquire T-Mobile first. Bloomberg reports that Sprint and its Japanese corporate owners Softbank are now making the rounds among banks to rustle up funding to make a bid on T-Mobile this summer. There’s a very good chance such a merger would fail, but if it does happen, expect much of T-Mobile’s recent progress to unravel. A combination of Sprint and T-Mobile would kick off a long, painful integration process similar to what happened when Sprint merged with Nextel last decade. Legere also said T-Mobile is now turning its attention to what is quickly becoming the biggest hole in its business model: tablets. In the last year, tablets have become a huge growth driver at AT&T and Verizon, which connected 1 million new slates to their networks between them. T-Mobile has been a non-factor in that market, but last month it launched a new component on Uncarrier that discounts tablet and tablet-plan prices. “While our competitors have been living off of tablets, we’re just getting started,” Legere said. T-Mobile also revealed it plans to move up its timeline for shutting down MetroPCS’s old CDMA network. Instead of starting the sunset process in 2015, networks in at least three cities – Philadelphia, Las Vegas and Boston – will get turned off this year. Tmobile is doing good but since I moved there in January they have increased their service price pretty much across the board. My family plan was 70 – 50 – 30, as of yesterday online it was 80 – 60 – 40. Two issues I have are: 1. As a state employee they offered me a 15% discount, as of this date I haven’t seen it reflected on my bill. 2. I stream stream radio and some YouTube and such. My two major radio apps Iheart and tunein, both lag continually and have since the beginning. I never had this problem with Verizon. Verizon just wants too much money for the amount of data my family consumes for 4 data phones. Tmo charges less, I didn’t expect less service. They do. You can get anything a new customer can get. They even added unlimited minutes to your plan if you are on a limited plan for no cost. Short-term loss, long-term… you get the picture. People have been complaining that the T-Mobile coverage area is tiny and this is a reason they won’t swap providers. T-Mobile might want to communicate that improvements are coming with the 700MHz spectrum purchase from Verizon. Their customer churn rates are the lowest out of the main competitors, but when there is no contracts and the competitors could price and product match, what measures will they employ to keep these numbers down? Let’s hope they block the Comcast Time-Warner merger too.